Can you truly dive into the pages of a favorite book? If you remember the stories of One Thousand and One Arabian Nights, then you know about the cruel king, the murdered wives, and clever Scheherazade who kept herself alive by telling the king stories each night. And you know about the brutal world into which the modern Shari has gone, bewitched into the pages of the “unexpurgated” Arabian Nights, where the king’s wicked behavior was not sugar-coated or glossed-over. 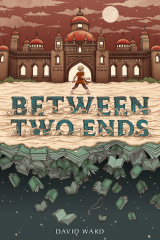 So on this World Wednesday, it will take a pair of bronze pirate bookends, a long-dormant wishing well, and all of Yeats’ courage and ingenuity to set Shari free from her enchantment and bring her back to her grandfather… will it be enough? An exciting tale from the author of The Grassland Trilogy (reviewed here, here, and here) – are you ready to go Between Two Ends with Yeats? Recommendation: Yeats wonders why his depressed father insists on returning to Gran’s house now – something dreadful happened there 20 years ago, something that is never discussed with him. Meeting eccentric Mr. Sutcliff, stumbling upon that old wishing well in the garden, and uncovering a bronze bookend suddenly takes Yeats into the heart of his family’s mystery. When his dad was a boy, he and adventurous Shari explored every inch of the garden and read every book in his poet-grandfather’s library, including one special copy of Arabian Nights. One terrible day, Shari was kidnapped from their garden, and William couldn’t stop the men as they escaped with her down the well. Losing his friend has kept him on the brink of madness for years and has turned her grandfather Mr. Sutcliff into a recluse, both certain that their Shari had been taken back in time, back into the oft-told story of her namesake Shaharazad, back to the realm of a king who killed his bride on their wedding night, night after night, bride after bride. By finding the long-lost pirate bookend and sending a wish into the well, Yeats has reopened the portal into Shaharazad’s world. Does Yeats have the courage to venture into the realms of story and imagination with the pirates? Can a modern boy survive in that brutal ancient kingdom? Can he find Shari and convince her to come back to her grandfather? This skillful combination of now and way-back-when will keep readers turning its 304 pages, traveling with Yeats to a far-off time and place where danger is the only certainty. (One of 5,000 books recommended on www.abookandahug.com) Review copy and cover image courtesy of the publisher.